Northern Bedford County students have advanced to next level in the Samsung Solve for Tomorrow Contest. The contest showcases the talents of student innovators who are identifying and addressing issues impacting their individual communities. NBC students took to the task of creating a system that will activate lights on signs indicating a school bus is in the area. 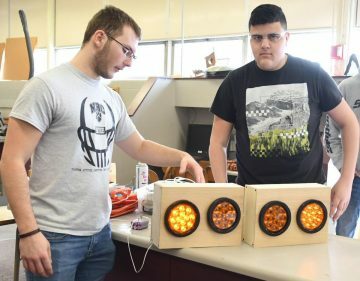 In November, the students began working on a prototype of a device that would be a transponder on the bus and a receiver on the lights that are mounted on the signs along the road. When the bus passes, it will trigger the lights on the signs to alert drivers that a school bus is in the area. The signs will be solar powered with a battery backup. That team is made up of seniors Maurizio Amato, Carson Foor, Kahleb Horton, Max Summers, Joe Summers, Bentley Zimmerman and sophomore Ian Zimmerman. Craig Curfman, technology education teacher has a passion for teaching his students but he also has a passion for student safety. He also drives school bus and had a safety related minor in his undergraduate degree. Just before Christmas, the students found out that their prototype was selected as the top in the state, which won the school $20,000 in technology including a video kit to create a 2- to 3-minute video explaining the project. The video will explain the project, the initial prototypes, how the project evolved, the problem and what it solves and how it impacts the community. The state winners will submit their videos and the top 10 schools will receive a $50,000 prize package and a trip to the final event to present their prototype to a panel of judges and Samsung will announce 3 national winners to receive a $100,000 prize package.